Everything here is about perfectly precise craftsmanship! 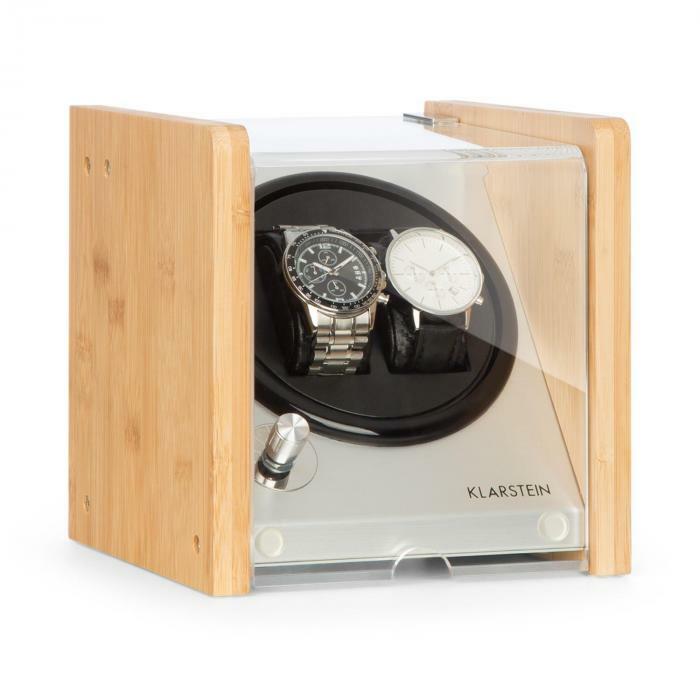 With the Klarstein Hanoi 2 watch winder, your elegant companions are always well maintained and ready for use. Automatic watches stored in the device are continuously wound up by 4 rotation modes and 3 different speeds simulating the movement of the wrist. The rotation also helps to maintain the movement by effectively counteracting the hardening of the oil greases. The Hanoi 2 watch winder convinces with an elegant bamboo housing, which stylishly fits into any room ambience. A brushed aluminium control surface gives the design its unmistakable brilliance, while the generously-proportioned acrylic glass window, visible from above and from the front, provides an unobstructed view of the automatic timepieces. With its modest dimensions and smooth, whisper-quiet motor, the watch winder can be placed directly on the bedside table or in other noise-sensitive zones. Please note that the watches pictured here are not part of the delivery.